Every year, the mercato gets more and more difficult to tolerate. At Milan, it has become the singular hope for some fans. As if everything that has destroyed this club these past four years could be overcome if we just get a couple of decent players. Or that having swapped out over 70 players in these four short years was a mistake, but these transfers, these players will make the difference. So people follow every account who tweets anything about transfers (most of them simply copying one another,) and check their phones every five minutes to see twenty different accounts all say, “The deal is almost done.” “The player will make his decision soon. Probably within hours.” And Milan fans will read these lies and retweet them and talk about them ad nauseum, even though the lies never change and nothing ever comes of them. Because following the mercato these days is like if football and heroin had a baby. It’s all just a bunch of lies you want me to tell you. "He's cheating on me with transfer news. I'm out." I have openly mocked my male counterparts about their addiction to rumors and transfer news. For a gender that widely harasses and abuses my football fandom simply because I have soft girly parts, this biannual courtship of the fantasy and make believe is way more entertaining than unicorns and rainbows. At least to a point. Then it just gets sad, like watching your addict brother looking for a fix. And not just looking for a fix, chasing you around the house with a knife to get money/keys to the car/whatever he needs to get his fix. (Not that I would know anything about what that is like, but…) It gets kind of scary. I need to open up a Transfers Anonymous program, but I don’t think anyone is interested in getting clean. Actually more frightening are the fans who have forsaken sacred fan rituals of watching press conferences from new coaches (even if they also talk about potential transfers,) and missing out on the first day of training (even though it was filled with great information about potential transfers in and out.) Our addiction to our phones and social media and our complete dependency on all things transfer related has cost us actually watching and following the very football that we originally set out to worship. Gone are the days when fans would go to Milanello en masse for Raduno, or would watch the trainings almost daily and comment on which players were training well and which ones were maybe disappointing. And viewership of actual friendlies and even Serie A matches is declining, because fans are still watching for news of a change. Except the only thing that is changing is them. Wait, is that l'Aeroplanino? Playing for Milan? How did I miss that transfer? We’re all waiting for change, for definitive news on the potential sale of the club. And with another potential delay announced today, it is beyond frustrating. I get that. But watching your phone 24/7 isn’t going to change when and if that happens. I get that it’s hard to put any trust in the management after so much epic fail. We are all in that same boat. But y’all are still putting your faith in their transfer fails, which have been some of the biggest parts of the systemic failure at Milan. 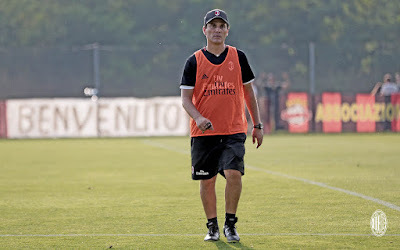 It’s really like watching drug addicts… “This time will be different…” “Just one more player…” “If they just sell the club, everything will change.” Meanwhile, you miss out on the actual discussions about transfers from the new coach and Galliani. But more importantly, you miss seeing the 500 other players we have, many of whom will be staying and need to link up with all of your Mister Xs. 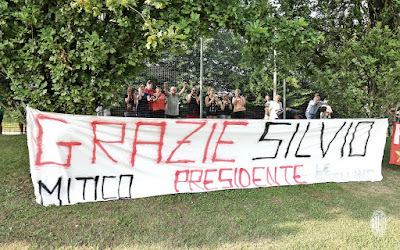 Sorry Silvio, lots of Milan fans claim to be grateful to you, but right now, they're waiting for news of the next guy. I get that new players represent hope and whatever you’re telling yourself as your girlfriend walks out the door because you won’t shut up about all of the transfer rumors. But it has become more than silly entertainment. It’s truly an addiction, one that is ruining football fandom. People who wait around watching for things that either are or are simply not going to happen miss out on what is actually happening. If all you can talk about are fantasies and make believe, you are missing out on reality. Like the reality of what is happening on the pitch. At Milanello. Twice daily. And soon in friendlies. And the thing is, you don’t have to follow some fellow addict’s non-stop tweeting of the same things over and over for it to happen or not. It’s either going to happen or it’s not. But if you don’t compulsively watch it, you’ll have time for the actual football part. And maybe even that girlfriend who just left… if you drop the phone and run, you just might catch her. I could join in and update a thousand times a day the same non-information all day long. But I just can’t sit here and tell you a bunch of lies you want to hear. So I’m just going to wait until the mercato closes and see what happens. In the meantime, I’m going to follow that team we all claim to love, and maybe watch some football.